Located 1 1/2 hrs West of Darwin. 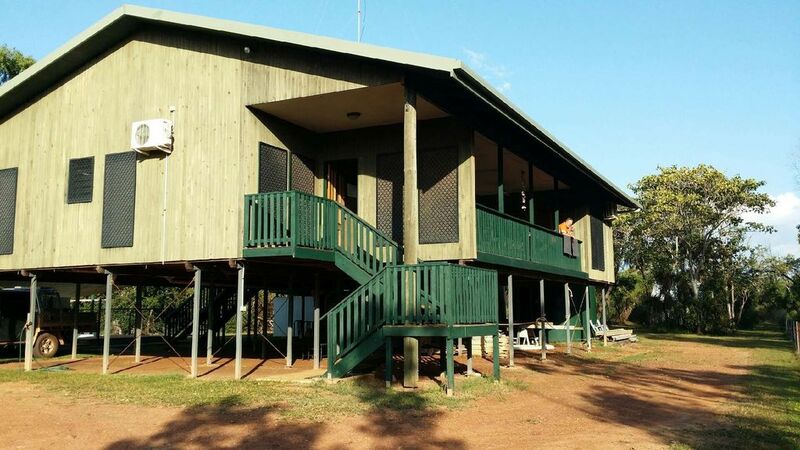 The Rest at Dundee is a spacious 3 airconditioned bedroom elevated house with ensuite. It has a fully functional kitchen with Microwave, hotplates, oven, Kettle, Toaster, rice cooker, and all plates and cutlery, A large fridge with Ice making and cold water in it. A large verandah and lounge looking towards a ocean view thru the cleared bushes. A laundry with a large washing machine and dryer and a small chest freezer. The Pool area has a Large 9 x 4 mtr pool and complete BBQ with sink and hot water built in. Activities include Fishing, Beach combing, Quad riding, Pool swimming, Bird and wildlife watching. Great house and location! Love the pool and the size of the house. Plenty of beds, only thing was the lounge aircon wouldn’t work and the water pump had to be reset quite often. Have stayed here before and will stay again! We had a great time here. Not far from the boat ramp. Plenty off rooms and clean. Overall very tidy and nice place to stay. We had a fantastic time, family of 5 and was very comfortable. Ginny made our stay very comfortable, we will be back. Close to beach, large house.